Trainer Willie Mullins followed in the footsteps of his father Paddy today by winning the Stan James Champion Hurdle. Hurricane Fly became Willie’s first success in one of the Cheltenham Festival’s championship races, and emulated Paddy’s achievement with Dawn Run, who won in 1984. The successful trainer said: “I’m delighted to follow my dad. One thing he taught me was to have patience with good horses. You have to be prepared to wait and wait, and we’ve done that on occasions during Hurricane Run’s career. Hurricane Fly, a son of top stallion Montjeu, wore ear plugs in today’s race, and Mullins said: “When he came to us he was very hyper, and it would certainly have been a big challenge to bring him to an event like this as a four-year-old, but under our training regime he gradually settled down. He’s worn ear plugs in just about all his races, but he’s a lot more mature now in any case. 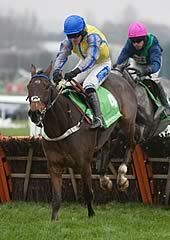 Peddlers Cross lost his unbeaten record with a brave second behind Hurricane Fly in the Stan James Champion Hurdle. Donald McCain’s stable star landed the Neptune Investment Novices’ Hurdle at the Cheltenham Festival 12 months earlier and returned to the track unbeaten in six starts over hurdles. The mount of Jason Maguire came close to extending that winning run but found Willie Mullins’ Hurricane Fly pulling a length and a quarter clear after jumping the final flight upsides. An emotional McCain said: “I am not a bad loser but I am just gutted for the horse. “Jason said that Peddlers Cross did not do a thing wrong through the race but was just not good enough on the day. “There are no excuses and he has found one too good. I have to say well done to Willie. “It was a hell of a race and he came for another go at the winner after the final flight. 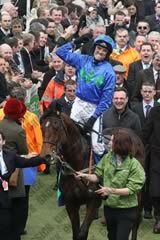 “I could not be prouder and I did think we had a good crack of winning the Champion Hurdle beforehand. “He has had the hardest race of his life today in defeat so we’ll see how he comes out of this before making plans. 1. The Champion Hurdle was inaugurated in 1927, with a value to the winner of £365. The race was abandoned in 1931 due to persistent frost, in 1943 and 1944 because of the Second World War, and in 2001 because of foot and mouth disease. 2. There have only been three sponsors of this great race since its inception. Waterford Crystal backed the contest from 1978 to 1990 while the Smurfit Group sponsored the race from 1991 to 2010. Stan James is the new sponsor in 2011. 5. Among jockeys, Tim Molony won the race most often with four victories, on Hatton’s Grace (1951) and Sir Ken (1952, 1953 & 1954). Tony ( A P) McCoy is the most successful current jockey with three wins aboard Make A Stand (1997), Brave Inca (2006) and Binocular (2010). 9. Four greys have won, the most recent being Rooster Booster in 2003. The others were Kribensis in 1990, , Our Hope in 1938 and Victor Norman in 1936. Only one roan horse has won the Champion Hurdle, Anzio in 1962.